Toyota Forklifts of Atlanta, a multi-year winner of the President's Award is proud to announce that we have once again been awarded the highly esteemed Toyota President’s Award – for the 3rd straight year! “Toyota’s President Award represents the highest caliber of work performed on behalf of our distinguished network body,” said Jeff Rufener, president of TMHU. 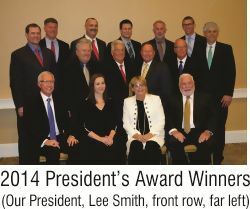 “We congratulate this year’s President’s Award winners for their ongoing commitment to delivering excellence in sales, customer service and aftermarket support.” In order to achieve this award, dealerships must demonstrate an un-bending commitment to the customer through superior service in all facets of dealership operations. From the signage on our buildings to the way we deliver our parts, every interaction with the customer must meet Toyota's stringent quality standards. We are all very proud to have worked so hard with our customers to earn this distinction. Each year, Toyota Material Handling U.S.A. (TMHU) honors its top dealers with the prestigious award, in recognition of excellence in parts and equipment sales, service, customer satisfaction and overall dealership operations.